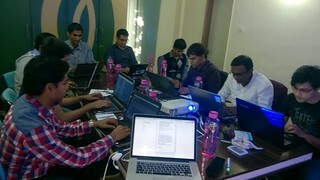 After leaving my full time job at Red Hat I started offering some free workshops in different cities on India. As currently I am staying in Bangalore and stayed in Pune for 8 years before moving, I choose both of these places to start with. Later I’ll be doing the free workshops in Chennai, Hyderabad and Delhi is coming months. Through the existing contacts and some social marketing I got good number of registrations. Most of them are currently from Bangalore and Pune. Good number of people want to have virtual training as well. As we can see from below social media played important role in getting the people registered. But word of mouth and announcing on different mailing lists got most people registered. In my workshops I want to keep limited seats so that I can focus on individuals. So I picked up random 10-12 people and requested them to deposit 1K INR to my account, which I promised to return on the day of workshop. This is to make sure people who confirms, attends the workshop. As I was doing free workshops I needed space for free or at low cost. In Bangalore, Red Hat offered me space for the workshop. Other than some setup issues everything worked as expected. Here is the feedback from one of the participants. Doing free workshops have been good learning experience so far and would work on the suggestions I got. Future free workshops are scheduled in Chennai (9th Jan’16), Hyderabad (30th Jan’16) and Delhi (13th Feb’16). Also first two day paid workshop is also scheduled for Bangalore on 23rd and 24th Jan’16. It was a rich experience and hands on with Docker ecosystem you provided. Looking forward to deepen skills under your guidance. Appreciate your methodology. Thank you again. Any further workshop or trainings planned .. I am planning to do a free virtual training (4 hours) in June. Next paid workshop in Bangalore in scheduled on 21st and 22nd May. I can do in Pune in July if there is enough interest.